Book with a deposit of £100 per person. ATOL protected. Looking for a Florida holiday February 2019? Half-term dates are popular so book early for the best accommodation and prices - even for peak departure dates around 9th and 16th February. This February 2019 Orlando holiday is based on a family of two adults and two children. Fly direct to Orlando with Virgin and stay for two weeks in a hotel on International Drive. A fully insured midsize SUV is included in the price. Looking for something different? Perhaps a February 2019 villa package (both Emerald Island and Windsor Hills are terrific value at this long notice). We can tailor any February 2019 Florida holiday to suit you. Call us or complete an online enquiry form for a written quote by email. Fly Virgin direct to Orlando from either Manchester or Gatwick. If you need to depart from a different airport we can arrange the connecting flight for a small fee. Your bags will be checked straight through to Orlando. Virgin include meals and drinks on their February 2019 Orlando flights, along with a decent baggage allowance. Their friendly crew will be on hand throughout the flight – good service makes all the difference on a long journey. Virgin are a family-friendly airline. Once onboard, children will receive a KiD backpack full of goodies. If this doesn't keep them entertained, the screen on every seatback will help – there are movies, TV shows and games for all ages. Children's meals can be provided at no extra cost. If you have other February 2019 Florida holiday plans, let us know. You can connect to Orlando via New York from Birmingham, Newcastle, Edinburgh, Glasgow or Belfast with United Airlines. Stay in New York for a couple of nights and take the opportunity for some sightseeing or shopping. United offer the stop-over at no extra charge – just pay for the accommodation. 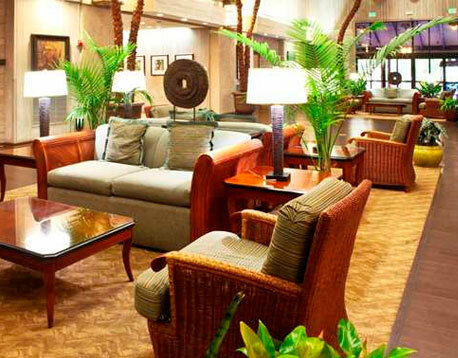 We have plenty of hotels to choose from in Times Square, Manhattan or Central Park area. Fitness centre with treadmills, exercise & weight-training equipment – and TVs! If this doesn't keep you entertained, SeaWorld is just across the road. Aquatica is within walking distance or a quick drive. 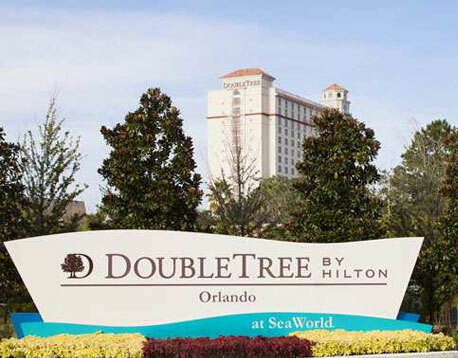 The Hilton offer a free shuttle service to SeaWorld, Disney and Universal. Further afield, Florida's Atlantic coast is just a 45-minute drive away. Visit the rolling beaches of Daytona and the Space Coast. Or spend some time in the Kennedy Space Center – we highly recommend a visit. There's lots to do on your February 2019 Florida holiday! Once you land at Orlando International your midsize SUV will be waiting for you, complete with Alamo Gold insurance. Don't worry about additional charges for insurance or extra drivers – even the first tank of fuel is included. This Florida holiday February 2019 is available from £855 per person. It includes Virgin flights to Orlando, two weeks at Doubletree by Hilton Orlando at Seaworld, and a fully-insured midsize SUV. Book with a deposit of just £100 per person – balances aren't due until 90 days before departure. Book early for the best February 2019 Orlando holiday prices – even for half-term peak dates. All of our holidays are ATOL protected. We can tailor any February 2019 Florida holiday to suit your requirements. Call our Florida experts on 01934 319 851 or complete a quick online enquiry form for a written quote by email. We have 2019 Florida holidays for every month of the year, Easter and Christmas. Fly Virgin to Orlando from any UK airport. Stay in your choice of hotel, apartment or luxury villa. Enjoy the theme parks, entertainment and Florida weather. If you don't see what you are looking for, get in touch – we can build any Florida holiday to suit your requirements. If February doesn't suit, perhaps a January 2019 Florida holiday? 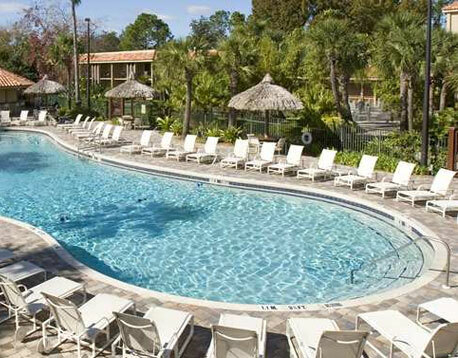 Fly Virgin to Tuscana Resort Orlando. 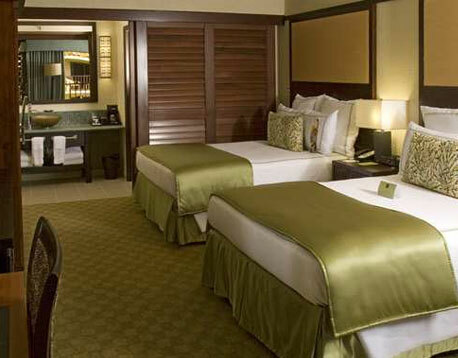 Stay for a fortnight just minutes from Disney World. Enjoy January's mild Florida sunshine – a perfect way to relax after the festive season. Book on deposit. All of our Florida holidays are ATOL protected.